Wisdom of Life. 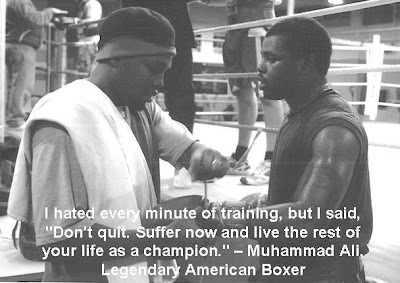 : Champion has to be trained. The greatest show on earth was the recent Beijing Olympic Games. The closing ceremony was magnificently presented to the world audience. Although i am not a keen sportsman, i was impressed by first the Jamaica's Usain for clocking an unbelievable time of 9.69 seconds for the 100 meter sprint. Making him currently the fastest man on planet earth. On the last day, Samuel Wanjiru completed the marathon run with an Olympic record time of 2'06:32. It was indeed a fantastic sport of great determination and drive. For all these champions to reach this far, i am sure they must had put in a lot of training and practices. They had to develop their stamina and built their strength. Their attitude had to be right and their self motivation had to be strong. I believe all exercises have to be trained in order to be good at them. Including bed exercise. Those who are inexperienced or weak, might complete the run on bed as 100 meter sprint. The show ends without even clocking 10 seconds. Making the other partner hanging and be frustrated. Such players should invoke for advices. My suggestions are, you need to run more to develop your heart stamina. Go often to the gym to build your muscle for strength. With the combination of stamina and strength, your body should be able to run further on bed. With a little patience and experience, your 100 meter sprint could be extended to 10,000 meter race. I prefer to take the marathon run and that is when my little darling sometimes complained.